Having a large waist is one of the biggest risk factors for developing diabetes. People who carry fat around their waist are also called “pear” shaped. Unlike “apple” shaped people who carry their fat throughout their body, pear shaped people carry their fat in the middle of the body, deep in the belly. 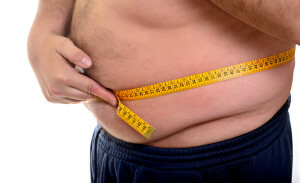 This deep belly fat is linked to a number of problems including, insulin resistance, reduced insulin production, nonalcoholic fatty liver disease, cardiovascular damage, nerve damage, and diabetes. The risk of developing diabetes increases with waistlines over 35 inches for women and over 40 inches for men. Fat deep in the belly puts extra stress on the organs it surrounds. Just one gram of excess fat around the pancreas is all it takes to overburden the organ. As the pancreas ramps up its insulin production to counteract the excess fat and sugar, beta cells are damaged. If not treated, the beta cells can become so damaged they are no longer able to make insulin leading to a lifelong dependence on insulin injections to manage blood glucose levels. Having excess fat around the liver will cause the organ to release excess glucose. This can lead to elevated blood glucose levels and eventually type 2 diabetes if not treated. Fat will also strain the liver and not allow it to remove toxins as well as it should, potentially leading to other problems. One gram of fat does not seem like it would impact the body so significantly, but it does. Fortunately, if the excess fat around the belly is reduced, most damage to the organs and cardiovascular system can be reversed. In most cases, type 2 diabetes can even be cured! If you have a “spare tire” around your waist and are worried about developing diabetes, or already have, you should talk to your doctor about a weight loss plan. There are several options you should consider including bariatric surgery, extremely low caloric diets, and more moderate diet and exercise regimens. To utilize the carbohydrate exchange, first you and your doctor or dietitian need to set a daily caloric goal. 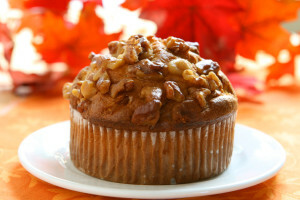 A healthy diet consists of 45 to 65 percent of your caloric intake coming from carbohydrates. As an example we will use the normal suggested levels of a daily caloric intake of 1,200 recommended for women and 1,600 recommended for men. That would set the carbohydrate calorie levels at 540 to 780 for women and 720 to 1040 per day for men. One gram of carbohydrates is equal to 4 calories, so you will need to divide the carbohydrate ranges by 4 to get how many grams of carbohydrates your daily intake allows. This will set the daily grams of carbohydrates between 135 to 195 for women and 180 to 260 for men. Next, calculate the exchange rate of carbohydrates you are allowed a day. To do this divide the allowable grams of carbohydrates by 15 since 15 grams is considered one serving. For women this would be between 9 to 13 and for men it would be 12 to 17 carbohydrate exchanges. Make sure you pay attention to serving sizes. Many food packages have multiple servings in one container. If you plan on eating the whole package you will need to multiply the carbohydrate grams by the number of servings. A package with 15 grams per serving and 2 servings would be equal to 30 grams of carbohydrates or 2 carbohydrate exchanges. If nutritional information is not available then you can calculate carbohydrates based on weight. An ounce of uncooked spaghetti contains 7.5 grams of carbohydrates. So in a 2 ounce serving, there would be 15 grams of carbohydrates or 1 carbohydrate exchange. Understanding how to use carbohydrate exchanges will allow you to better manage your blood sugar levels while still enjoying a diverse diet. 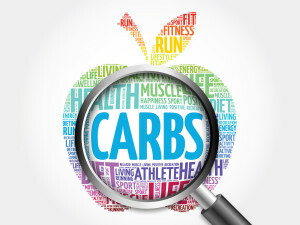 There are several resources available as a reference for carbohydrate exchanges. 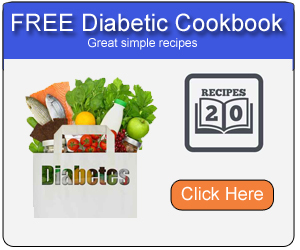 There are quick reference on the internet, and the American Diabetes Association frequently publishes a book called Choose Your Foods that is for sale if you prefer to have the reference guide on hand. 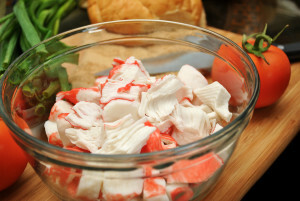 This creamy hot spinach and crab dip is very high in vitamins A and C. By substituting vegetables instead of bread or chips, this can be a delicious and diabetic friendly appetizer! Sugar is the main source of energy for our cells. Normally, the pancreas makes insulin and the insulin then carries the glucose into the cells to be broken down for energy. Diabetics are either not able to produce any or enough insulin or are not able to use it properly due to insulin resistance. If there is not enough insulin present to carry glucose into the cells, hormones are then released. Hormones such as adrenaline and cortisol break down fat as fuel instead of glucose. The by-product of the fats being broken down are ketones. As excess ketones build up in the blood it becomes more acidic and you can develop diabetic ketoacidosis (DKA). DKA is a potentially life-threatening condition and must be addressed as quickly as possible. DKA can happen to any diabetic, but it is more likely to occur in Type 1 diabetics and other diabetics who have a limited ability to produce insulin. Nausea, vomiting, abdominal pain. If vomiting continues for more than 2 hours, contact your doctor immediately. Checking for ketones can be done with a urine test strip similar to a blood test strip. Experts advise that you check your urine for ketones if your blood glucose is more than 240 mg/dl. You should check for ketones every 4-6 hours if you are ill and while your blood sugar is elevated. You should also check your ketone levels if you are experiencing any symptoms of DKA. If your test reveals a high level of ketones, you should call your doctor immediately. You will need to be able to tell your doctor if you have high levels of ketones, if your blood glucose is high, and if you have vomited more than twice in four hours. DKA can be caused by not enough insulin from missing a dose or being sick, not eating enough food, or low blood glucose. Diabetic ketoacidosis is a dangerous and potentially deadly condition. Contact your doctor immediately if you are experiencing any symptoms of DKA or have elevated levels of ketones. 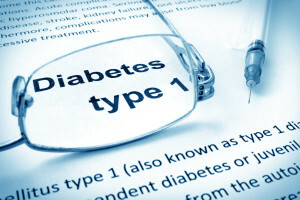 Type 1.5 diabetes, also known as latent autoimmune diabetes of adults (LADA), is a form of diabetes where an adult has aspects of both type 1 and type 2 diabetes. Type 1 diabetes, also known as juvenile diabetes is caused by an autoimmune destruction of beta cells in the pancreas. As the beta cells are destroyed the amount of insulin released decreases and eventually stops leaving the person dependent on injections of insulin to regulate blood sugar levels. Type 2 diabetes, also known as adult-onset diabetes, is caused by insulin resistance and beta-cell dysfunction. Type 2 diabetics may can control blood sugar levels with medication, diet, and exercise and may require insulin injections as well. While type 2 diabetes may be prevented and reversed, there is no cure for type 1 diabetes. . Type 1.5 diabetes has also been called slow-progressing Type 1 diabetes. Researchers noticed that a number of patients who did not require insulin at the time they were diagnosed with diabetes also showed a significant number auto-antibodies. Specifically antibodies that target beta cells in the pancreas, destroying their ability to manufacture insulin. Type 1.5 diabetics may be able to control their blood sugar levels with diet and oral medication initially, but within a few years they will need to use insulin because of the destruction of their beta cells. 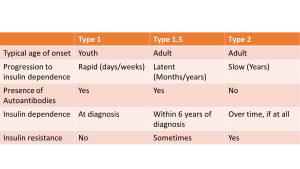 Type 1.5 diabetics should also be screened for auto-antibodies to adrenal and thyroid cells as they are at a higher risk of also having autoimmune diseases. 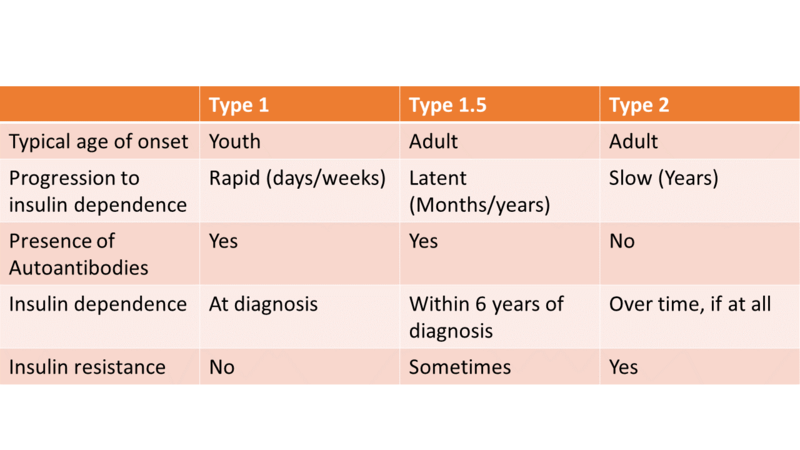 Below is a chart comparing the key characteristics of Types 1, 1.5, and 2 diabetes. 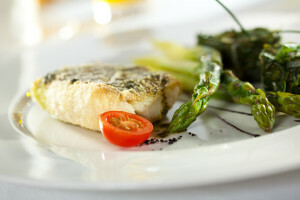 If you are trying to control your caloric intake, non-starchy vegetables are a great option. The low number of calories in non-starchy vegetables will afford you the opportunity to eat larger portions and feel fuller longer, while at the same time you will have a significant reduction in calories versus other types of foods. 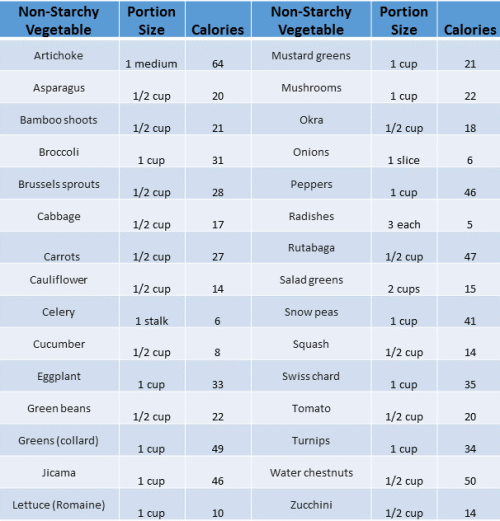 Below is a chart of a typical serving size of various non-starchy vegetables and their respective caloric impact.